We are your best line of legal action against the insurance companies, corporations, prosecutors, and government bullies. We will never accept a case from any of them. If they create legal problems for you, let us FIX it. 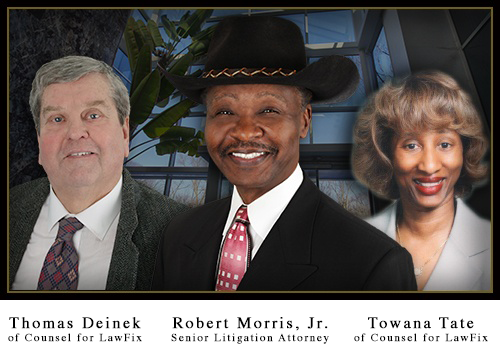 LawFix attorneys have over 70 years of experience getting the best results for our clients. The attorneys associated with LawFix had careers before becoming attorneys that are the foundation for their investigation, preparation and presentation of your case. Their collective experiences include, employment as law enforcement officers with experience from homicide, detectives, narcotics and as department supervisors and coordinators in circuit court. As attorneys they have obtained millions of dollars for clients in state and federal courts for civil cases as well as outstanding results for our clients in criminal cases. LawFix attorneys have experience from many areas of the legal arena. LawFix will fight your legal battle in any local, county, state or federal court in the country. There are over 38,000 attorneys licensed to practice in Michigan. The National Trial Lawyers Association publishes a list of “Top 100 trial lawyers in Michigan.” Two of the attorneys on that list are associated with LawFix. There are over 1.2 million attorneys licensed to practice in the United States but less than 25% of them are admitted to practice in the United States Supreme Court. One of the attorneys associated with our firm is included in this 25%. We will never charge any client, in a civil case, not one penny, for attorney fees or the expenses we invest in your case, unless we win your legal fight. We will never charge you a fee for advice. Just contact us and get a free initial consultation. If we don’t perform a legal service, we will not accept your money. LawFix will provide succinct and thorough explanations for some of the complicated language in statutes and decisions written by Judges, along with a plain talk legal analysis. If you request, we will provide you a copy of the statutes and cases so you can read the actual language that we have summarized for you. We will not take your money unless we have contributed a real effort towards fixing your problem. That is why we are LawFix, the legal solutions for real people. We Get Results!